1. Continue working on the boys' room. I want to wash all of Shep's clothes and organize his drawers. 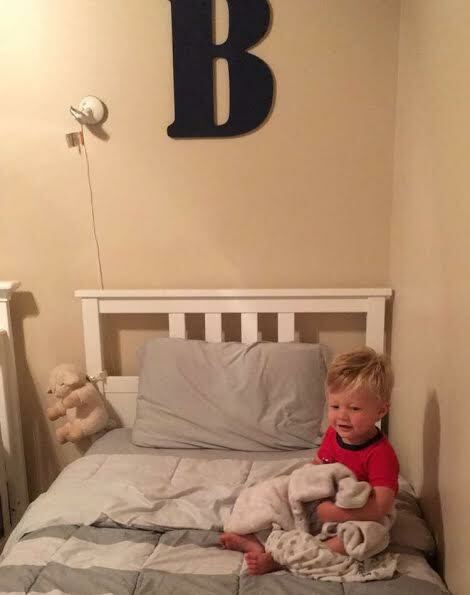 I also want to finish getting Bennett's new bed ready. & I still need to find bedding. 2. Make a citronella candle + complete other projects with our essential oils. I finally found bedding that I liked for BT's room! I got it all washed and put on his bed yesterday and it looks so cute : ) He hasn't started sleeping in there yet because (long story short..) our monitor screen has been broken and I just do not feel comfortable with him in there without me being able to see him. Our new monitor should be here this weekend so next week is go time! I initially thought I wanted to wash and organize all of Shep's newborn clothes but I realized that was ridiculous since I still have 10ish weeks to go. I will probably wait until the beginning of August to do this. I had planned to finish up maternity plans this month but I got a call from my principal a couple weeks ago asking if I wanted to move down to teach 1st & 2nd grade math (& 2nd grade science/ss/writing). I knew this was a possibility but with going on maternity leave I never dreamed they would actually let me do it. I was SO excited to get that call. So needless to say I've had to completely re-do my plans for the year and get ready to teach two new grades! We are going on our babymoon next weekend to Charleston, SC and I CANNOT WAIT. I have only been once and Adam has never been so it will be fun to explore together. Since it's only a 3 hour drive we decided to leave early Saturday morning and spend all day Saturday and Sunday there. It will be so nice to get away one last time just the two of us before Shep arrives. 2. Work on back to school and maternity leave plans. I can also get back into my classroom sometime this month so I will need to move everything from my old room to my new room and set up my new room.. AHHH..
3. Enjoy 10 full days with NICOLE!